Jordy faced off against Mick Fanning in the semis and although he only scored three waves, two of those waves were strong rides scoring 7.83 and 7.00 points. Mick on the other hand had ten waves scored, but struggled for quality and finished with a combined total of 8.26 points. The other semifinal was a serious battle between two Brazilians, Adriano and Gabriel Medina. The heat was super competitive as both surfers traded waves (and airs). Each surfer had a 7 point ride under his jersey when Adriano upped the ante with two huge hacks that scored him an 8.77. Medina fired right back, sticking a monster air reverse for a 9.70 and the lead. But Adriano countered with an air of his own that scored 8.87 to retake the lead himself. In the closing minutes of the heat, Medina landed another air, that, based on his claim, he thought had won him the heat (although Brazilians will claim anything). Bumor for him, the judges disagreed and gave him only a 7.60. The final score was 17.64 to 17.30, and Adriano moved on to face Jordy in the finals. Jordy and Adriano ratcheted up the action in the finals. 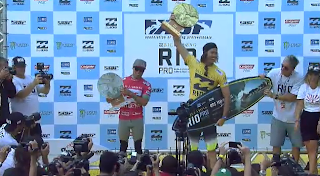 They each had back to back 7 point waves scored, but Adriano already had a 6 point wave and was sitting in the lead when Jordy landed a double-air 8.50 wave and took the lead. He increased his lead on his next wave, probably the biggest air-grab of the competition, a 9.30. A late 8.47 by Adriano made it close, but Jordy held on for the title. In only 2 weeks, they'll be back at in Fiji when the Volcom Fiji Pro kicks off at Tavarua on June 2. It's still only 3 events in but we might finally be seeing a changing of the guard on the WCT as Jordy and Adriano push past champions like Mick Fanning, Joel Parkinson and even Kelly Slater down the rankings. Will Jordy and Adriano meet up for a third straight competition at the Fiji Pro? Is their rivalry the new Andy-Kelly rivalry? Will John John return from injury to shake things up? Stay tuned.